Flow Tubes: Directed Light Inc.
Flow tubes and flow plates are used in water-cooled Nd:YAG lasers to channel cool water at high-velocity across the surface of the lamp and rod. Velocity is the key consideration for transporting heat away from the lamp and rod. Pyrex is the most popular flow tube material because it is inexpensive, transmits well in the Nd:YAG pump bands and effectively filters ultraviolet light. Cerium Doped Quartz is the next most common flow tube material. Quartz is more mechanically rugged than Pyrex, and is more resistant to thermal cracking. The Cerium dopant filters UV almost as well as Pyrex and has the added advantage of fluorescing in the Nd:YAG absorption bands. 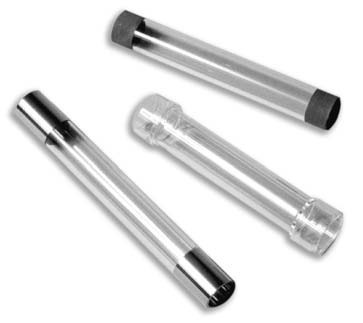 Cerium Doped Quartz flow tubes yield better YAG efficiencies and last longer than Pyrex, but they are more expensive. Samarium Doped Glass is an even more effective optical filter and fluorescent material. However, its high cost limits its application mainly to military and scientific applications. Without a flow tube, “eddies” or areas of slow water flow could develop in the laser cavity, resulting in hotspots, irregular rod temperature, or boiling. The laser designer intentionally specifies a narrow gap between the flow tube and the lamp or rod. In this way, even a small volume of water under high pressure will travel across the lamp and rod surfaces at high velocity, eliminating the need for higher capacity pumps and reservoirs. It is important to replace chipped or cracked flow tubes, even if no water leaks are apparent, as they can change the flow path and slow the flow rate across the lamp or rod. Flow tubes and flow plates also serve as optical filters for unwanted wavelengths of light. While Xenon and Krypton lamps are excellent sources of the wavelengths which excite Nd:YAG, they also emit a great deal of visible and ultraviolet light which can be detrimental to the lasiång process. For example, wavelengths which are not in the Nd:YAG pump bands may add heat to the rod, reducing its efficiency. Ultraviolet light can cause permanent solarization, changing the color of the rod and reducing its efficiency. The ideal flow tube material would only transmit wavelengths in the rod pump band; actual flow tube materials are a compromise between this goal and cost. Narrow bandpass coatings could be used to achieve the ideal flow tube which only transmits useful wavelengths. However, thus far, the coating process is too expensive to be practical for commercial laser flow tubes.